Stair rods are an eye-catching decorative feature which fit across each step of your staircase. They add style and character to the heart of your home. We sell a comprehensive selection of designs, sizes and finishes available – shop here. They are excellent at enhancing and revitalising the most mundane-looking of staircases. From cheap stair rods which you can cut-to-fit, to solid brass, made-to-measure stair rods for runners – we offer designs to suit everyone. All our ranges have a runner option i.e. they can be ordered with brackets suitable for fitting with a runner. These are fitted up the centre of your staircase, either side of your stair carpet. Simply select the ‘Runner’ option when ordering. 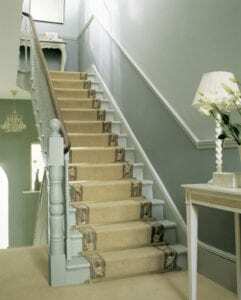 Some designs are also available for fitted carpets which cover the full width of your stairs. In these cases select either the ‘Front Fix’ or ‘Side Fix’ bracket options. The diameter of the rod depends on the scale of your staircase, particularly the width of the steps. A 12mm (1/2”) diameter rod is recommended as suitable for the typical house. A wide staircase, such as those found in hotels, requires a more substantial diameter rod and the Country, Eastern Promise and Premier ranges are available in larger options up to 19mm (3/4”). All are supplied with a pair of matching stair rod brackets. Whilst most stairrods are cylindrical, the Royale and Tudor ranges have a flat, visible face and are supplied with matching triangular stair rod brackets. The design first became popular in the early 19th century and works particularly well in a period property. Further decorative embellishments provide additional interest, including the reeded and spiral stair runner rods style, which are available in the Eastern Promise, Crystal, Vision and Country ranges of hollow stair runner rods, and the hexagonal-rod of the Premier Hanover design. The stairrods finials, often referred to as the ‘end pieces’, help define the overall style of your staircase. If you are looking for a period feel then take a look at ranges such as the solid brass Premier, the quirky Country designs, or the traditional Royale stairs rods. Alternatively, the Victorian carpet clips provide a neat option. More contemporary designs include the Vision and Crystal ranges. In terms of finish, the choice of metal finishes available means you can complement other accessories, such as light fittings, door furniture and carpet thresholds. This is a great way to achieve a note of sophistication to your décor scheme. The finish choice is extensive−everything from traditional, polished brass stairs rods to the latest fashion in black and chrome stair rods. The wrought iron and stainless steel effects in the Blacksmith provide a rustic and industrial note, whilst the timeless appeal of wood makes the Tudor range a natural option. The price of stairrods varies depending on the complexity of the design, quality, finish and length. If you are looking for some cheap stair rods then take a look at the value Homepride and Jubilee ranges, which are available in fixed lengths that you cut to size yourself. All our other ranges are made-to-measure and offer fine quality and detailing, along with a matching pair of stair rod brackets. Fit the carpet runner first and start fitting the brackets from the bottom step upwards. Place the bottom part of each pair of brackets either side of the runner, adjacent to the edge and in the angle where the tread joins the riser. Drill a pilot hole: 2.5mm for soft wood and 3mm for hardwood. Use a low torque on a power drill to avoid breaking the screws. Drill a clearance hole of 4mm for the screw shank. Screw in the top screw, which is internal. Place your stair rod centrally in the brackets & attach the top section of the brackets and screw in the second screw, which is visible. 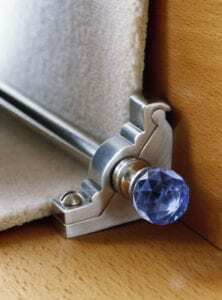 Note: for fully fitted carpets, the brackets are fitted on top of the rod and screw in through the carpet. It seems common to inherit old carpet rods without any brackets – they always appear to be what gets lost over time. We sell cylindrical and triangular pairs of brackets in a variety of finishes. Beware – you may find older rods are more slender in diameter to those sold today. In which case, you can simply stuff with some foam to prevent them from moving around unnecessarily. Screw in the top screw, which is internal. Place your rod centrally in the brackets and attach the top section of the brackets and screw in the second screw, which is visible. Feel free to use the form below to ask our experienced team a question about your needs and we will come back to you with expert advice.